Here defining this headquarters location are Sub-Zero Showroom Branded Arcs that also echo the Wolf brand. But these could serve double duty in branding any Sub-Zero retailer too. Appliances are shown as footer images but the main sell is lifestyle marketing above. 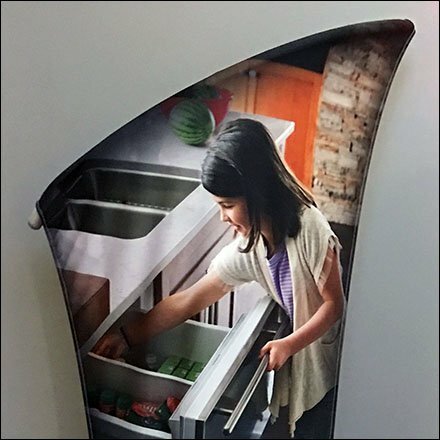 Consider these twin vertical signs in the Sub-Zero Showroom Branded Arcs gallery of images. Seen at the Sub-Zero / Wolf Showroom in Pine Brook, New Jersey.